In a few weeks I'll be reviewing the new Talk & Soothe Digital Video Monitor from The First Years. In the meantime, I wanted to share a special offer from The First Years, Target and Snapfish that makes this monitor a great holiday gift for new or expecting parents like me! Through Jan. 31, 2014, customers who purchase specially marked The First Years monitors (the new Talk & Soothe Digital Video Monitor, the Crisp & Clear Double or Single Audio Monitor) in-store at Target will receive a gift from Snapfish, including a FREE classic photo book or a discount off of their entire photo book order. There are so many incredible milestones in the first years of a child’s life. The complete line of award-winning feeding, care, travel and nursery products from The First Years can help new parents reach these milestones safely and happily. From affordable high tech video monitors to the most thoughtful breast pump ever, to the first and only Smartphone-synched car seat, to spill-proof sippy cups with an easy-to-clean one-piece lid, The First Years offers parents the products, and the confidence in them, that will help make raising their child one of life’s most rewarding experiences. WOW! A video monitor AND snapfish album? NICE! My mother in law gave my son a snapfish album for Christmas with photos from his summer visit to thier house in another state. It is SO Amazing and high Quality! A keepsake for sure. YES!!! It's definitely a great promotion, you just can't go wrong!!! I wish I had a video monitor for my kiddos. I didn't' though. This sounds like a great promotion. I love photo albums! Thank you for sharing. I can't wait to see more from The First Years here on your blog. 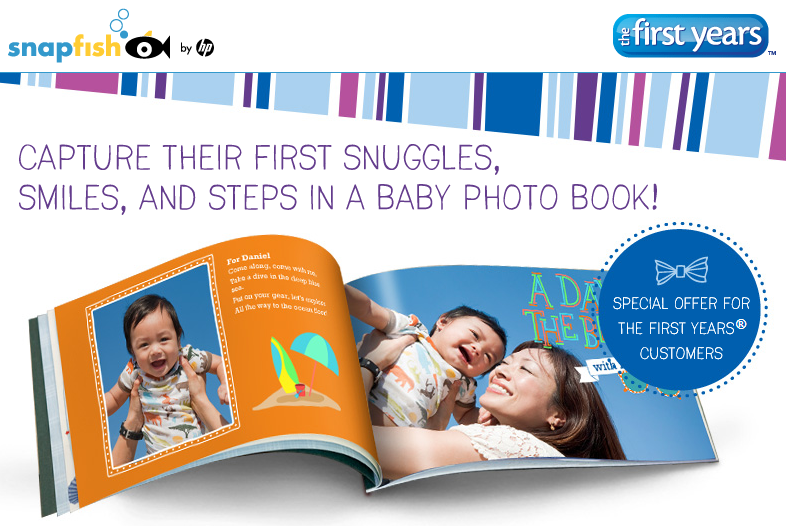 I love photobooks :) We have a local company creating photobooks here - already had around 6 made :) that's a great deal.